At LostAngel’s sky is turned dark red and you can feel the shivers and fright in the cold night athmosphere… … it’s Halloween! 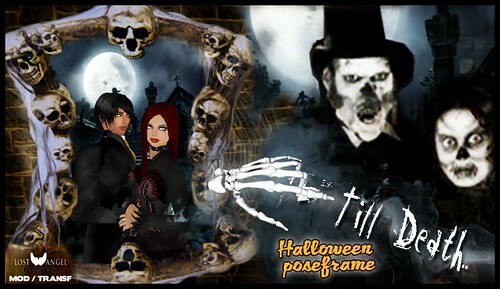 * HALLOWEEN POSEFRAMES * with Spooky Special Effects and Scary Sounds! …burning in hell’s flames…but with some style! This frame is wicked! Don’t dare to pose on this frame with your lover!! Practicing dark magic and casting love voodoo spells…. Run from the Zombies!! get out of frame before they get you!! You must check this out!………. it’s DEADLY funny! .. Just follow the bloody footprints!